There’s something not quite right about humanoid robots. They are cute up to a point, but once they become a bit too realistic, they often start to creep us out – a foible called the uncanny valley. Now Facebook wants robots to climb their way out of it. Researchers at Facebook’s AI lab have developed an expressive bot, an animation controlled by an artificially intelligent algorithm. 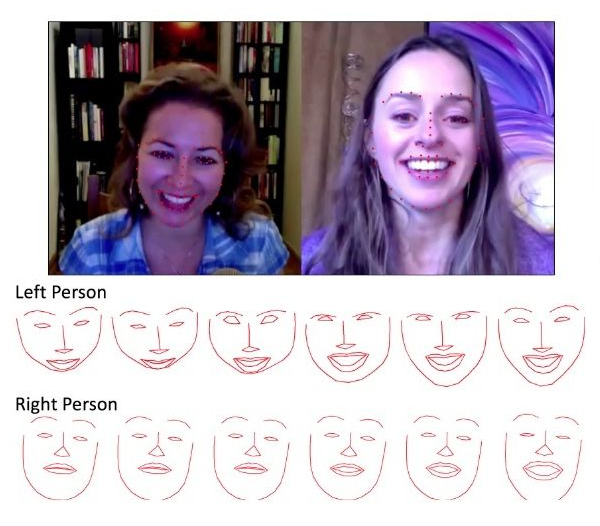 The algorithm was trained on hundreds of videos of Skype conversations, so that it could learn and then mimic how humans adjust their expressions in response to each other. In tests, it successfully passed as human-like. To optimise its learning, the algorithm divided the human face into 68 key points that it monitored throughout each Skype conversation. People naturally produce nods, blinks and various mouth movements to show they are engaged with the person they are talking to, and eventually the system learned to do this too. The bot was then able to look at a video of a human speaking, and choose in real time what the most appropriate facial response would be. If the person was laughing, for example, the bot might choose to open its mouth too, or tilt its head. The Facebook team then tested the system with panels of people who watched animations that included both the bot reacting to a human, and a human reacting to a human. The volunteers judged the bot and the human to be equally natural and realistic. However, as the animations were quite basic, it’s not clear whether a humanoid robot powered by this algorithm would have natural-seeming reactions. In this case, the Facebook system ends up creating a kind of “average personality”, says Louis-Philippe Morency at Carnegie Mellon University in Pittsburgh. In future, more sophisticated bots might be able to pick from a range of personalities or adapt their own to match the person they are talking to. Facebook will present the work at the International Conference on Intelligent Robots and Systems in Vancouver, Canada, later this month.